Login or if you're not a member sign up today! Become a fan on Facebook! Click here to visit our page. In this article we want to talk about how your campervan trip can become a proper adventure into Europe’s best wilderness areas. Campervans provide the ticket to adventure travel in the wilderness. Compact vehicles with many mod cons and the size to be able to navigate many of Scotland’s single track roads. Motorhomes can do this too, however you need to be more confident driving a larger vehicle, especially if you need to turn in a tight space. Most of the campervan explorers we meet are keen to get as far away from civilisation as possible. This desire to find quiet places, majestic scenery, a wild place they can call their own and importantly, partake in a range of outdoor activities. There is no better feeling to be in the middle of nowhere and doing the things you love most. The activities most often enjoyed are mountain biking, walking, kayaking, bird watching, oh and let’s not forget, doing nothing. As a wild camper you have a responsibility to use your common sense. Strange term this, as it is not nearly as common as we would all hope. Leave the place as you find it, take responsibility for your own actions, keep pets under control, respect the privacy of others, especially land owners and private dwellings. Do not leave litter and be careful what you discard into the ground. If you have one, use your waste tank and do not empty until at designated spots like a local campsite. Same obviously applies to the toilet. Take rubbish away and don’t bury toilet paper or other litter as animals will sniff it out and dig it up. You’ll also attract furry guests to your wild camp. With all that in mind set off in search of your own wilderness spot. Scotland, and particularly the west and north western coasts are truly amazing places. With jaw dropping scenery, deserted beaches and hidden gems of roads that go nowhere; you are spoilt for choice. To wild camp and really feel that you are in control of the adventure, you must search out your own locations. That way it becomes yours. It is your own special little spot. I would bet you that even though you will wax lyrical to your friends about the amazing spots you found, you may even decide to remain vague on where exactly you were. So how do you find these gems, the ones you will want to keep secret? 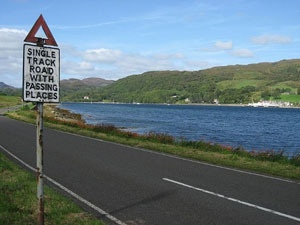 Well, the advice we generally give is hug the coastline and look out for roads displaying the T dead end sign. The best ones are those that are also single track roads with passing places. Firstly, you won’t find a caravan owner contemplating this type of road and secondly it doesn’t take you anywhere. These signs are invitations to the wild camper to explore further. There is no guarantee these roads will lead to your perfect spot, however rewards will await those prepared to put in the effort and time. Even if your perfect spot is not down every road I’ll expect you won’t be disappointed with what you find. If you are successful you will find the road takes you to a peninsula or a wild stony beach. They’ll be seals bobbing in the water or sunbathing on a rock or two. You’ll turn the engine off and be overwhelmed by the silence, except for the occasional squawk of duck or geese. You’ve arrived, and you’ll want to stay. If your common sense says it is ok to stay, then do so. Now you know you are in your wilderness. Enjoy and respect the little space on our planet that you have found. As much as you would like to stay for days I would encourage you to move on. Stay with the coast and search out new locations. You may think it goes against the grain of wild camping to suggest a campsite, however in this part of the world many campsites are just one step up from a deserted field on the waters edge. To me I still consider this wild. It is not a bad idea to do this type of place every 2-3 days. You can restock some food essentials from the local store, replenish water, recharge the batteries, empty the toilets and be ready for the next part of your journey. If you decide to do this part of the world I would highly recommend stopping at the following places. They are not to be missed and all are in keeping with the wilderness theme. Most westerly point in British mainland. On a clear day this is an amazing stop. The road via Kilchoan is single track with passing places with plenty of wee stop offs for wild camping along the way. 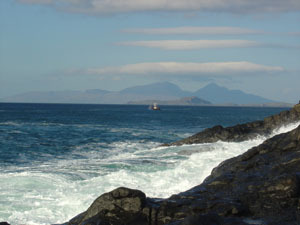 Achmelvich Bay & Beach, Nr Lochinver (56o10’09”N, 5o18’08”W). Lovely beach, and “wild camp” campsite. This is a gem. Following a decent walk (4.3miles 1.5 hours) walk from car park at Blairmore and you are rewarded with one of the best beaches on the western mainland. Pack a picnic and rug and you can spend hours there. 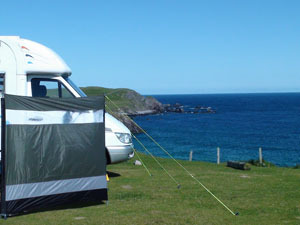 Durness has another wild camping feel campsite. Perch yourself on the cliff edge. There is no other landmass north of here. You are looking straight to the artic. The seas are turquoise, beaches are smooth and a rugged coastline keeps it very interesting. 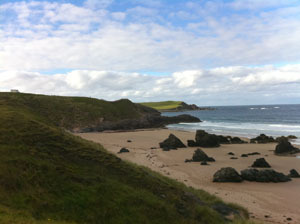 Walk from Durness to Faraid Heid and you could be mistaken for walking through the desert, the dunes are so high. These suggestions only skim the surface of where you could find yourself. It is your adventure, your exploration so get out there and see how wild Scotland can make you. We are very lucky in Scotland to have different legislation regarding wild camping and access to the great outdoors. The Scottish Outdoor Access Code has made it clear what we can and cannot do. It is worth noting that the Code does not cover motorised vehicles so there are some obvious limitations to wild camping in Campervans and Motorhomes. This entry was posted in Wild Camping. Bookmark the permalink. Wild Camping. The choices we make.